This article covers how to integrate your ClockShark schedule with your personal calendar. 1. Go to the Schedules or My Time Clock screen and click the "Subscribe" button. Although you can find the "Subscribe" button on both the Schedules and My Time Clock screens, only the personal schedule of the logged-in user is available from the My Time Clock screen, since this is the employee view of the website. Administrators can allow employees to subscribe to other coworkers' calendars by enabling their Manager Permissions for viewing and editing schedules. 2. Click to choose the employee schedules you would like to subscribe to. You can select the schedule for an individual employee, or all employees. You can also choose by Department or Location. 4. Copy and use this URL to import your ClockShark schedule as a calendar into Google, Yahoo, etc. 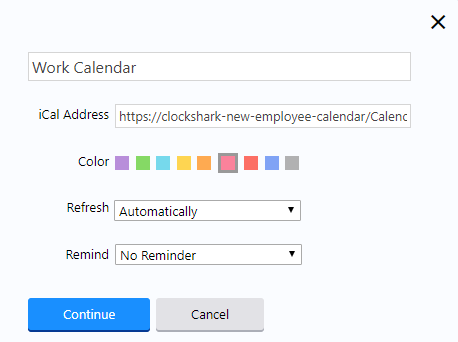 Once you are subscribed to a calendar, it will automatically update and refresh to reflect any changes made in ClockShark. Please note that these updates sometimes can take more than 24 hours. Please let us know if you have any questions about subscribing to your ClockShark schedule. I. 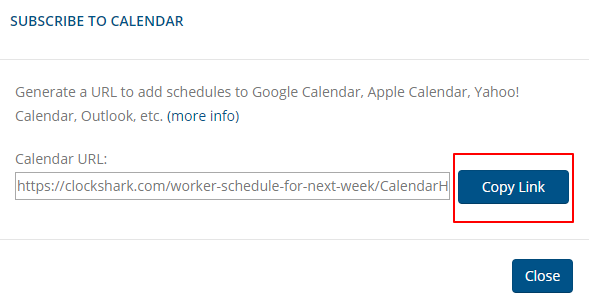 Copy the link from Step 3 and click to add a new calendar from a URL in your Google Calendar screen. II. Paste the URL and click "Add Calendar". That's it! 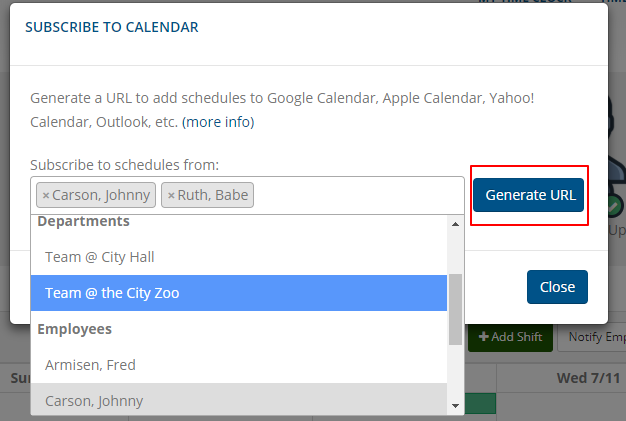 The default name may be the URL name, but you can edit and rename the calendar. I. Copy the URL from Step 3 and add a new calendar in your Yahoo calendar view by clicking "Follow Other Calendars". II. Name your calendar, and paste the URL into the iCal Address box. III. Click to continue. Your calendar will then appear in your Yahoo calendar view. I. In the navigation of your Outlook calendar, click "Discover Calendars". II. Under Import Calendar, select "From Web". III. Paste your URL from Step 3 above into the "Link to the Calendar" box. IV. Name your calendar and click "Import". I. From your computer, email yourself a copy of the link from Step 3. II. Open your email and tap the link. III. Tap the "Add All" button to add the schedule to your calendar.